ILumi, with the range of its second-generation smart bulbs extended to 150 feet after a Bluetooth 4.0 upgrade, now behaves inside the home a little more like Philips’ Hue, Belkin’s WeMo and other Wi-Fi-connected bulbs. At least for simple on-off commands generated from a nearby smartphone. But try to turn a light on or off while away from home and iLumi’s second-generation bulbs, available in A19 ($59.99) and BR30 ($69.99) sizes, become more like my local cable company’s customer service: unreachable. Beyond Bluetooth range, the associated iOS and Android apps are useless. It’s a tough climb for iLumi, because depending on Bluetooth also has excluded it from the burgeoning parallel connected-home universe populated by SmartThings, Apple’s HomeKit, and other Wi-Fi-compatible technology. So why Bluetooth? Ilumi Solutions says it likes the simplicity. It gives consumers a bulb, Bluetooth and an app, with no baffling bridge-to-router hub needed. Hallelujah! But hear this, hub-and-router-phobes: WeMo’s plug-in Link acts as a Wi-Fi hub, but it doesn’t connect to a router and sets up almost as easily as an iLumi system. And a Hue starter kit, with two E26 bulbs and hub, costs $79.95, or only about $20 more than a single iLumi A19. Ilumi's A19 LED bulbs can produce 800 lumens of brightness, while its BR30 bulb can produce an outstanding 1100 lumens.. The iLumi Solutions backstory, however, is a charmer: The company was founded in 2011 at the University of Texas-Dallas by MBA classmates Corey Egan and Swapnil Bora, followed by Indiegogo-Kickstarter crowdfunding and a “Shark Tank” star moment that ended with Cuban’s $350,000 stake worth 25 percent of the company. The MBA buds built their bulbs around Bluetooth and a proprietary technology called HyperLux which, they say, maximizes lumens-per-watt in multicolor LED bulbs. 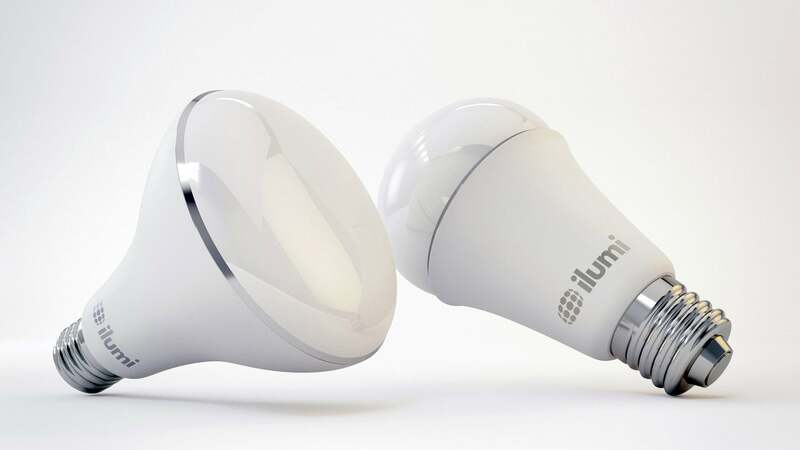 Without always-on Wi-Fi, iLumi bulbs rely on built-in flash memory and a real-time clock with battery backup, so that settings won’t vaporize in a power outage. They’re built like a bulbous brickhouse. Make sure your fixture can handle the heft. I’d take the A19, a stout 4.5 inches tall and 7.2 ounces, in a steel-cage match any day against my little first-generation Hue A19. At a HyperLux-powered 800 lumens, equivalent to a 60-watt incandescent, it’s brighter than my 600-lumen Hue and matches Hue’s current A19. The BR30, with more diffuse dispersion for recessed lighting fixtures, is rated at 1100-plus lumens, an 85-watt equivalent. Both bulbs are LED-efficient. Using a watt meter, I measured the A19 at 9.8 watts and the BR30 at 14.4 watts at their brightest white. Each bulb produces white light from 2000- to 5000K—an upcoming app update will include a tunable whites menu—and a deep, rich color palette. Their color rendering index (CRI), a scale that tops out at 100 in measuring a light source’s accuracy, floats between 82 and 94 depending on the brightness of white. Color saturation is a highlight: Within the Groups screen, you’ll find a six-choice color palette and, for custom colors, a color wheel with an inner dial that adjusts saturation. Ilumi's app is available on both the Android and iOS operating systems. 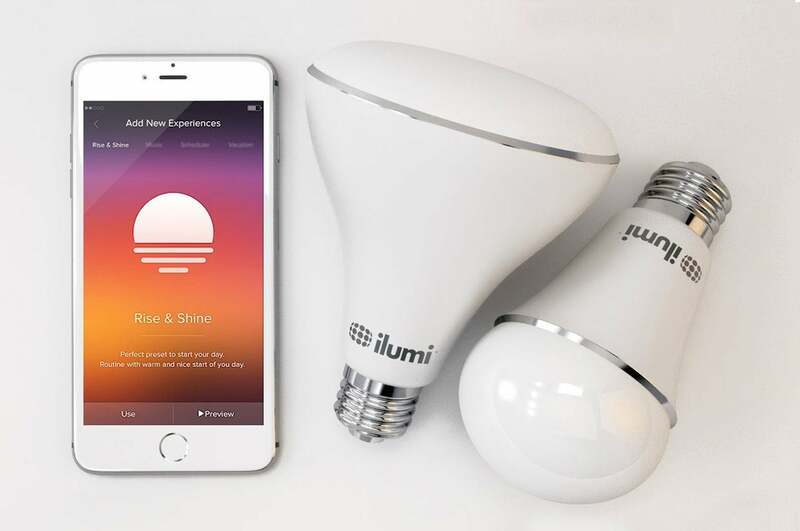 Ilumi supports up to 50 bulbs, a staggering total that amounts to $2999.50 for a maxed-out—and presumably massive—home bathed in Bluetooth-connected A19 lighting. Yet the company delivers on its simplicity promise, with a pairing-by-color system oblivious to your modem, router and Wi-Fi status. Complaints? The app lacks a universal on-off switch. Confusion: Why use a camera icon to create a scene? When I paired four lights, each showed as a circular icon in the iOS app that matched the color of the newly paired bulb. Then I created groups and dragged the bulbs into the desired destination (as in “Den” or “TV Room”). Each bulb, only on initial installation/pairing, cycles through its red-green-blue color arsenal, as if it’s stretching after a golden slumber. Use the grouped bulbs to create scenes, then schedule those scenes for certain days or times with iLumi’s “Experiences.” The app comes loaded with several stock Experience options, among them a “Disco” music sync, a “Circadian” mode designed to mimic the sun’s daily cycle and a smartphone-sensing “Torch” mode. Ilumi's bulbs cost about the same as Zuli's smart plugs, but they aren't as well integrated with other connected-home systems. The iLumi music-syncs the way I dance, painfully out of step. (Typical music sync.) When the Circadian mode turned one bulb green, it scared this earthling—though, true, the sun’s mix of colors includes short-wavelength green that’s scattered in the Earth’s atmosphere. “Torch” is the most promising, and potentially most useful, Experience. After a distance-sensitivity adjustment in the app, it turned a light on when I (with iPhone) entered a room and off maybe two minutes later. In this respect, iLumi is very similar to Zuli Smart Plugs. It did not work reliably, unfortunately. That became a theme with scheduled modes. Ilumi is halfway home with Bluetooth: I separated four bulbs as far away as possible in my smallish cape and none lost touch with the app. 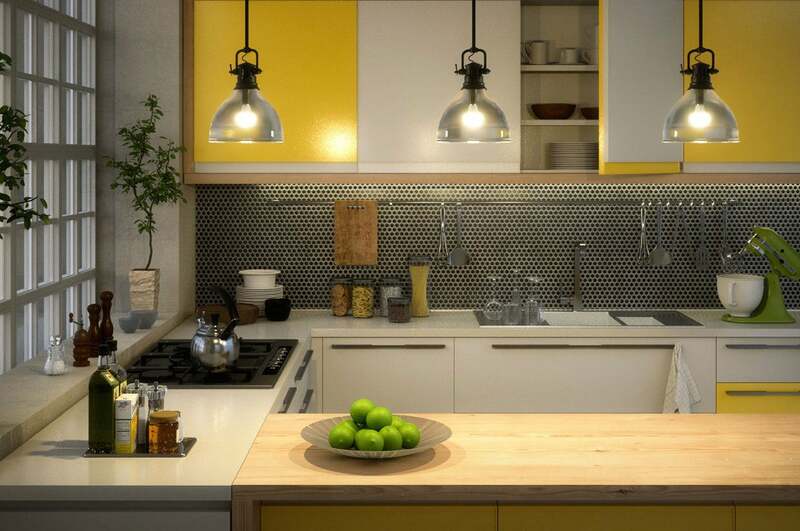 I could also sync the bulbs to produce the same, or even different, colors. But once grouped in a Scene and scheduled to turn on via “Experiences” each night, at least one bulb always seemed reluctant, either refusing to turn on or off. It should work better, though any smart-bulb or smart-home device I’ve tried—Hue, WeMo, or iDevices—sometimes refuses to follow a schedule. I’m happy with a 90 percent-plus response rate. Ilumi’s schedules succeed maybe 45 percent of the time; not bad if you’re shooting NBA three-pointers, but unacceptable for a smart bulb. I would be less concerned if these were first-generation bulbs. An app update will soon explain the camera icon—it’s part of a suggestive-lighting feature that uses a snapshot of a room to produce a complementary colors scheme—and add other features. Of greater long-range significance, the company is also hoping to make its bulbs work with If This Then That (IFTT) recipes, Nest smart-home products, Apple Watch and Android Wear, and the Amazon Echo speaker. That’s progress, and perhaps a more appropriate time to judge iLumi against Wi-Fi bulbs. But I would still miss being able to adjust lighting manually while away from home—which I do now with both Hue and WeMo bulbs during my twice-weekly overnights. If iLumi Solutions were still selling the A19 at the $29 Kickstarter price available in mid-2015, it might convince people to give up connected-home compatibility, remote access and geofencing triggers that adjust lights when entering or leaving a home. It’s a lot to give up at $60 and $70 per bulb. Bluetooth won the portable-speaker war, but it’s still not close to beating down Wi-Fi under the hot lights of the connected home.